Panama is a vital nation in Central America, being the thinnest part of the bridge linking south, and north, and hosting a canal, linking the Pacific with the Caribbean sea. This cuts days off journeys round the south of South America. Panama first gained its independence from Spain in 1821, only to become a department of Colombia. The first serious idea came from Frenchman Philippe-Jean Bunau-Varilla. He took the American flag, possibly because of America's hand in helping to free Panama, but then he altered it to fit Panama. 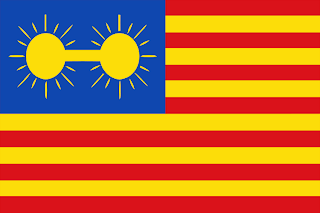 The white stripes where replaced with yellow, in homage to Panama's history with Spain.And he removed the stars from the blue field, and replaced them with 2 yellow suns, connected by a bridge. This was either to represent Panama's position as a link between 2 oceans, or to symbolise Panama's link between North and South America. However, this flag was rejected because it was designed by a foreigner. Then, finally, in 1903, Panama succeeded from seceding from Colombia to become totally independent. This was achieved with heavy assistance from the United States, and as part of the help, Panama had to cede a wide tract of land to the Americans where they would build the Panama canal. The new flag that was introduced was divided between the 4 cantons. the lower right canton was blue, representing the conservatives in Panama. The top left was red, representing the liberals. The white used in the other cantons representing purity, peace, and unity between all the peoples of Panama. The red star represents the authority of law, and blue represents the honesty of life in Panama.